Augmented reality might seem a phenomenon that’s gaining popularity in recent times, but low-tech AR solutions have been around and highly popular for ages. Who hasn’t had fun once sticking his or her head through a stick-your-head-through-this-plane? Instantly entering the reality of Superman, or whatever creature or hero. 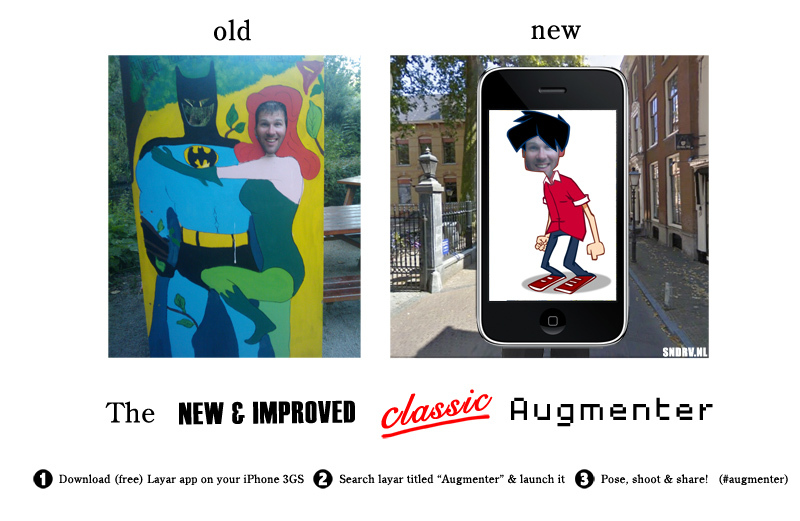 The “New & Improved Classic Augmented” brings back that old fun, in a contemporary and efficient way. This ‘augmentation’ layar includes a series of instant realities available to you at all times, anywhere you are, on your smartphone. To use it, download the “Layar AR browser” on your iPhone or Android phone, and search for the layar ‘augmenter’. Open it, position your friend into the picture and take the snapshot!